AXIS Dance Company’s 2014 home season at Oakland’s Malonga Theater was an event to remember. Not only were there two amazing works from Guest Artistic Director Marc Brew and a dance film by Alex Ketley, but also on the program was a re-staged version of Yvonne Rainer’s preeminent post-modern work, “Trio A”. Seeing any version of “Trio A” live and in person is a gift. Such an integral part of the 1960s postmodern movement, this work still holds such value and necessity for the contemporary dance community, even close to fifty years after its premiere. “Trio A” is devoted to movement, physicality and choreographic tools. And because of its highly structural and formal concerns, the audience becomes privy to a rarely seen phenomenon. One where artistic creation, artistic process and an entire stream of artistic consciousness unfolds, free of constraints, narrative and assumptions. Under the guidance of répétiteur/stager Linda K. Johnson, AXIS Dance Company leapt into this monumental project, bringing the world premiere of their version, entitled “Trio A Pressured #X”. The integrity of the original project was intact – the single task-oriented movement phrase, the lack of eye contact with the audience, dancers beginning the sequence at different times and at different facings. For AXIS, “Trio A Pressured #X” featured four cast members (as opposed to the typical three), and two of the dancers were in wheelchairs. Rainer’s phrase was deeply understood and well-translated by all four, and Johnson did a superb job of staging the work, keeping its true intention yet being open to and exploring the possibilities that came with four uniquely different bodies. Alex Ketley’s dance film, “The Gift (of Impermanence)” was a visual poem, a tribute to the work of this extraordinary contemporary dance company. Through a revue collection of snippets, excerpts and remembrances, dancers met, interacted with each other through movement and then parted. “The Gift (of Impermanence)” was not a historic chronology of AXIS Dance Company’s past twenty-seven years. Rather, through beautiful and touching dance imagery, Ketley was claiming AXIS Dance Company’s present artistic moment. Marc Brew’s 2008 work, “Remember When”, also began with a film/video segment. A black and white mall scene bustled on the backdrop; its focus, the escalator. Images of Brew dancing in his wheelchair overlaid with the mechanism of the cycling staircase. The film continued and combined with Brew, who was now downstage left. Specific, placed and accented movements spoke of mechanical processes, but with a lush, expansive undertone. Following intermission, Brew premiered his newest work, “Divide”. Another quartet, this conceptual dance hinted at the space between perception and reality. The lighting design (by Allen Willner) was key to creating and maintaining this theme. Lines and squares of light appeared for a time on the stage, and at one point or another, all four dancers dealt with their real but imaginary existence. When the light was present, it created a true line or space of demarcation. Sonsherée Giles’ first solo traversed a balance beam of light – fondu arabesques, turns, pivots, shifts of weight – all never leaving that illuminated line. Later groups of dancers traveled in and out of light squares that appeared, disappeared and reappeared around the perimeter of the stage. Thinking along the title of the piece, were these divides actual or projected? 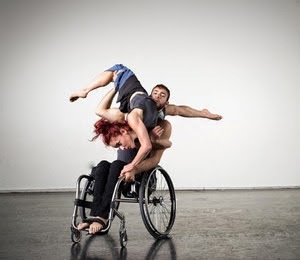 Mid-way through “Divide”, Brew created a gorgeous pas de deux that had one of the most stunning dance poses ever: Joel Brown extended his upper body sagittally to the ground and placed his right palm on the stage; Giles stood on the left wheel of his wheelchair and extended her leg in a classic modern dance tilt. This long second position was breathtaking.